Work Formerly Done by Indians Now Made an Art Here. Strange Pictures on Skins and Wood in Miss Binckley's Studio. Chicago the Only Other Place in the United States Where the Art Is Practiced. 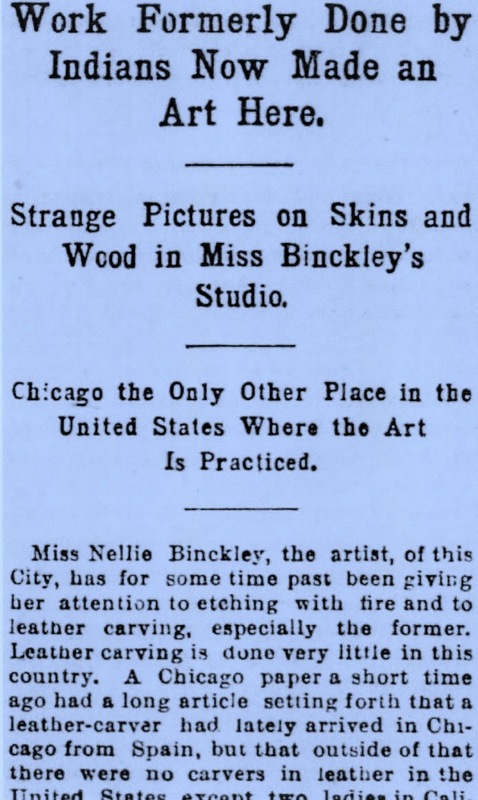 Miss Nellie Binckley, the artist, of this City, has for some time past been giving her attention to etching with fire and to leather carving, especially the former. Leather carving is done very little in this country. A Chicago paper a short time ago had a long article setting forth that a leather-carver had lately arrived in Chicago from Spain, but that outside of that there were no carvers in leather in the United States, except two ladies in California. Miss Binckley's studio on Sutter street shows a large amount of etchings by fire. The etchings are chiefly on wood and leather. She says that really the original etchings here were done by the Indians, as may be seen by an examination of the inner sides of the bearskins, elkskins and hides of other animals on which they have drawn curious Indian figures with fire. The burning lines are traced by the pointed piece of steel known as a cautery, which is kept red hot by the generation of hydrocarbon vapor in a small bottle. "California furnishes a most attractive field for a fine etcher or professional, for there is such a fascinating variety of beautiful woods to choose from. Those most used are poplar, sycamore, white holly, redwood and madrone. The latter has a tone admirable as a suggestion of flesh tint and is excellent for heads," said the lady yesterday. “Leather is as much adapted for this decoration as wood and is almost as durable. A new leather has been prepared by a special process for fire etching. It is called velvet calf and has an exquisite velvety surface, something like suede or undressed kid, and is soft and pliable. It is dyed in a variety of colors, usually gray, terra cotta and green. Sheepskin is tanned with the same velvety finish now and is much less expensive than the calf. "Then there is leather carving. This has been done a great deal in Germany, but it is considered more distinctively Mexican. It is entirely different from the old Spanish and German stamped leather and is literally carved with sharp toos. A Mexican has recently begun doing this work in Chicago and O'Hara & Livermore intend to introduce it here. "In the older Mexican towns dark-eyed artisans work still at the leather, wondrously cut and carved, and known to all the world as a remnant of the days when every man was a cavalier, and his saddle the proudest of his possessions. “Now comes the etching of the leather, technically called pirogravure, growing under the hands that is dominant today — the race of new women. As to my own work in fine etching, my specialty is heads and figures. It bores me to extinction to do conventional designs. I hate to do anything which has to be exactly the same on each side. It is purely mechanical. Any one can do it. It only requires care. It is no particular credit to get it perfect and it is disgraceful to get it wrong. "But to do a figure design well is something that interests one more, and is to a great or less extent an achievement. One must feel it enter into the spirit of the design or it will be stiff and wooden. It takes a sure eye and a steady hand, and a sufficient knowledge of anatomy (in figure work), to give the worker the power of assimilating the designs, and putting it forth again from his own brain without the necessity for constant reference to the design. "When one makes a long, flowing line, it is disastrous to glance aside at the copy. An instant's pause in the progress of your red hot point and a hole, or at least a period, appears, and the line is spoiled." Among the etchings which Miss Binckley has is one of Cypress Point, near Monterey, with a view of the sea; figures of Indians and Chinese and of bears and other wild animals.